On Wednesday, a report from the Office of the Auditor General was released to the public news stream about the Royal Military College of Canada, and its essential message was one of summary about studies launched in the past about the utility of RMC and its role as an essential military education institution for aspiring officers in the CAF. The end conclusion was one of agreement with all previous recommendations for changes to the ROTP program at RMC and the way RMC itself is run. In the wake of its fundamental essence, however—is RMC worth it both cost-wise and in the production of its graduates—it had an unexpected effect on the very Officer Cadets in question at the college. We’ve been through countless changes in the past four years, seen the rise and fall of various leadership approaches both within and outside the cadet chains of authority, but what holds RMC together despite these changes is the exact same military spirit and ethos it is designed to instill in its students. After reading the AG report, the general reaction throughout the Wing was one of rejuvenated pride in what RMC accomplishes and has taught us. The idea that RMC’s value as an officer-generating institution for the Forces could be questioned came as a surprise, and this past week has seen a shift in the thought culture of the students here. We thought the value of RMC was implicit in its mission statement, and even though the end result of the report stated that RMC should continue as a military academy for undergraduate and graduate studies for officer cadets and military members, it’s initial premise made us all realize just what it has to offer that makes it so exceptional, and is the reason it is still going strong 140 years later. Many of the students in the Wing left other jobs, universities, and career paths to come here, and it’s not just because of the free education. We came for the military training, the language training, the academic proficiency of the faculty and especially the small class sizes—which promote excellence and enhanced learning–, the physical challenge, the comradery, and the unspoken sense of latent history in the limestone edifices and treed waterside landscape. RMC is a living history, and those who pass under the Arch seem to be stepping into the roles and persons of distinguished military officers of the past who have completed their initial education at the college. RMC does not offer a free ride—rather, it promises difficulty. It is not the difficulty that is thrown on you, however—it is the kind of difficulty we chose to undertake because we knew it would test us and push us to fulfill our potential as leaders. Continued change aside, the Truth, Duty, and Valour of this organization will not be stifled. This is by far the most sensible response I have seen to the Auditor General’s report. Eliza has shown a degree of wisdom far beyond her years. Well done, Eliza, and best wishes for continued success in your future career. Prompt, articulate and excellent treatment of a delecate subject by Eliza. Congratulations! Congratulations Eliza. More articles by more Cadets to newspapers in their respective hometowns (cc: the Auditor General), would help to mitigate unjust criticism of our military colleges. Excellent comment and perspective, OCdt Bruce!! Thanks for an excellent article, Eliza. It’s great to hear what current cadets feel about this issue. I second the Bravo Zulu! Excellent reply Elisa. So well done. The impact of the A.G.’s remarks about whether or not the investment in R.M.C. is worth it certainly suggests that some changes may be necessary. That evaluation is certainly open for interpretation. 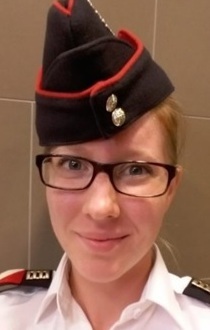 However, there is an expression that says “You haven’t baked a cake until you bake a cake !” The Officer Cadet spends 4 years baking all sorts of cakes, each one different and unique and requiring special focus and attention. Please remember, we are developing the bakers who are giving it all they got with enthusiasm and perseverance. Let’s just focus on changing the dough that they have to work with so that it rises so much higher. Canada has a tremendous thing going here with these young men and women, let’s keep the focus on the dough and not impinge the bakers who are giving it their very best to co-operate in their personal development as leaders. Well said Elisa. A great number of former RMC attendees really appreciate the training we received and the esprit de corps we developed at RMC. I am sure we all appreciate and share in your views of what RMC means to current cadets, ex-cadets, other non-cadet alumni, and most importantly the rest of the country. Congratulations and all the best to you in your future endeavours. Thank you for this, Eliza. Well articulated! Keep up the great work. Couldn’t agree more Eliza! The values instilled in me as a young Officer-Cadet are still with me 35 years later. These fundamental values, have not only served me from a career perspective but have allowed me to face the inevitable difficulties that life throws at you along the way. Well done!